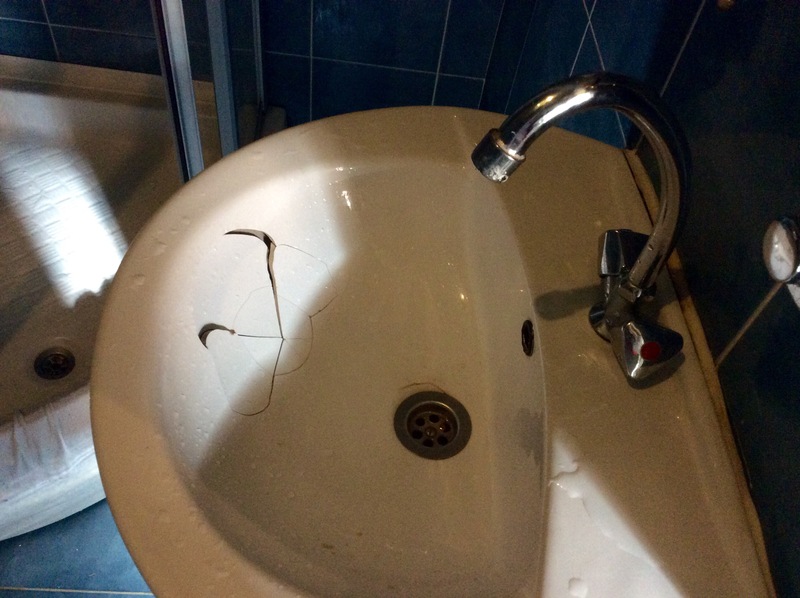 They just don’t make sinks like they used to! 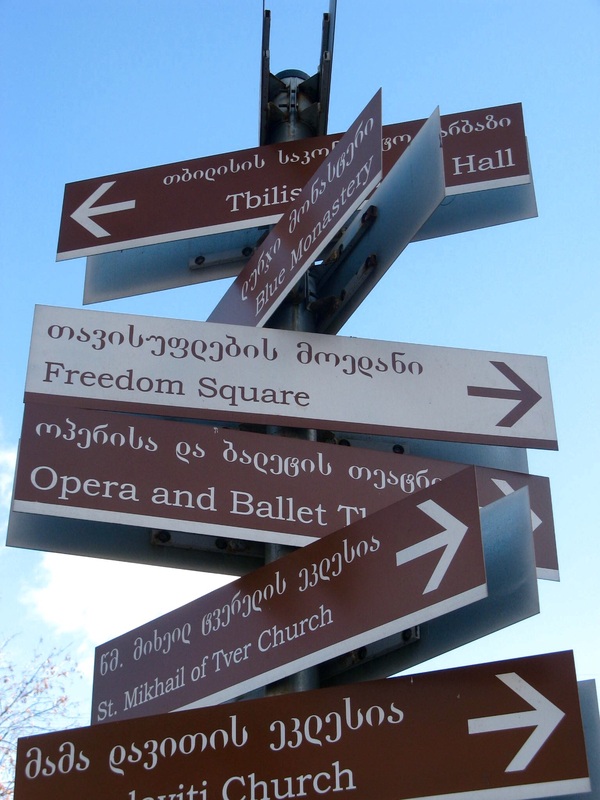 Today we walked down Rustaveli Avenue, the main avenue in our part of town, to see what we could see. The streets are wide, and the drivers aggressive, like New Yorkers, leaning on their horns. Pedestrians aren’t permitted to cross the street, but use pedestrian underpasses filled with small shops and panhandlers. There are more old women begging than we’ve seen in a while. The souvenir market is set up daily on the wide steps of one of the ornate but deserted buildings, and includes artisans working on new paintings as they sell their wares. We hear western music, in English, and see that there is an affinity for American things here. The buses have seen better days. There are staid, old buildings, amid flashy new hotels and casinos. Casinos seem to be a big thing here. We looked into one, but they took my camera, (as well as inspecting my eyeglasses for hidden gadgets! ), so no pix. The golden statue is St. George and the Dragon. He is very popular with the Greek Orthodox. We stop at a Greek Orthodox Church. 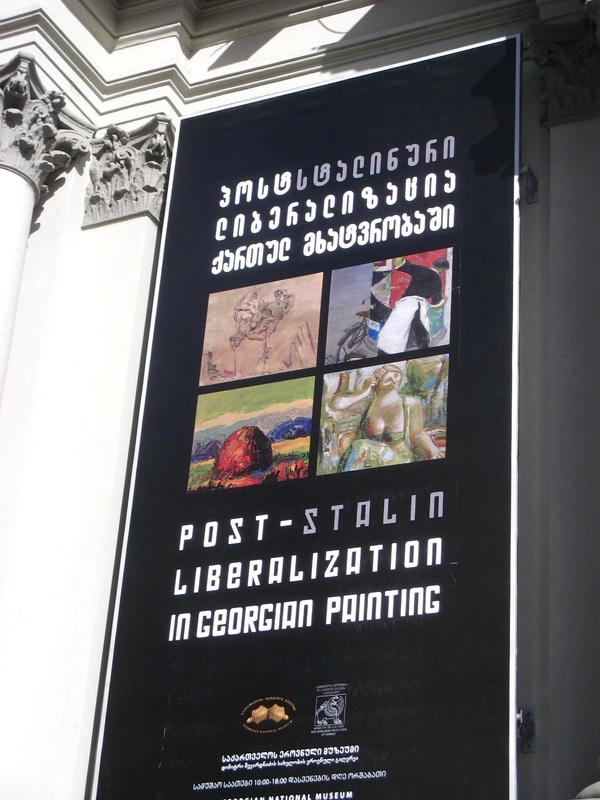 We walked by the museums of modern art, archeology and Georgian history, but don’t go in. I’m not sure I’m up for this exhibit. We have lunch at a cafe advertising authentic Georgian food. We figure we better have some, as we will only be here one more day! 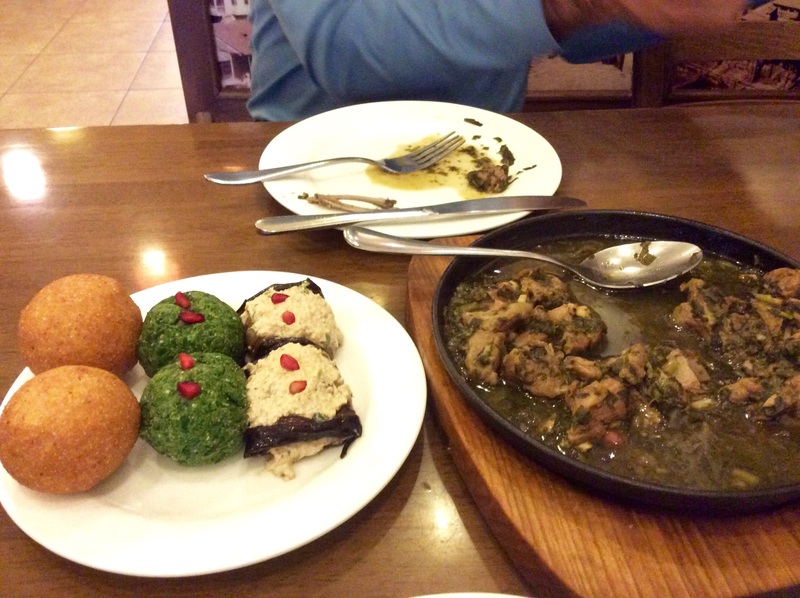 Beef stew, a warm corn pie (a big hush puppy), cold spinach balls, and cold eggplant, decorated with pomegranate seeds. Very tasty. Tomorrow we will return to the train station for an overnight sleeper to Baku, Azerbaijan. From there we will determine if it is possible to book passage on a commercial ferry to Kazakhstan. We’ve read many blogs about the complexities of this leg of the journey, and will remain flexible if it turns out that it can’t be arranged in the 10 days permitted on our Azerbaijan visa. The main focus is to get to China before the end of February. Stay tuned! China in two weeks ? You better hope that ferry comes through ! My google map shows a hell of a long walk around the Caspian Sea if you don’t ! Remember my warnings about the “stan” countries my friend ! Take Care !!! 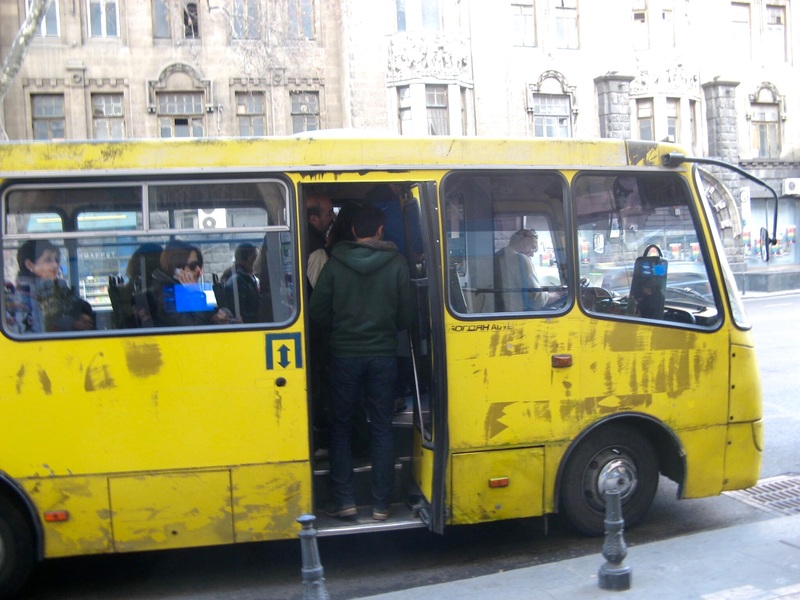 Thanks Kel- we got off the train this morning in scenic Baku, Azerbaijan. Quite the place…. We’ll find out within the next few days if the ferry is possible. If not, we’ll fly over the Caspian into Kazakhstan. It’s our only Stan, and all that separates us from China. Wish us luck!